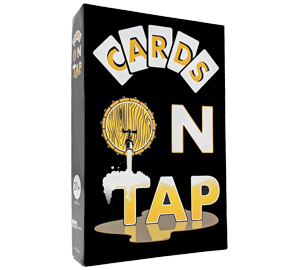 Cards On Tap is a social drinking party game so simple it doesn’t even need a rulebook. Grab your friends, shuffle the deck, draw some cards, and drink. It’s that easy! Each deck of Cards On Tap includes 200 unique cards that will keep the fun going as long as you want. With so many cards and so many topics covered, no two games will be the same. And be careful as some of these cards may end up having you reveal more about yourself than you bargained for! With two ways to play you can choose exactly what kind of drinking game you want to play. Want to keep it simple and just drink without worrying about winners and losers? Shuffle up and play the “Something Basic” version. In the mood to be a little bit competitive without getting bogged down by rules? Try the “Last Beer Standing” version that lets you declare a winner and see who can stay coherent the longest.